Our training enables academics to develop effective individual strategies for funding their research through grants and the skills both to pursue their individual strategies effectively and to support the development of colleagues. We help individuals develop the skills necessary to write good research grant applications and the understanding necessary to decide what kinds of application to write. We help institutions develop processes that encourage and support colleagues to write better grant applications and to target them more effectively. We offer consultancy and support for individual writing projects. Participants in our training exercises develop an in-depth understanding of the way the grant application process works. They develop appropriate personal strategies that enable them to decide what kinds of grants they should apply for, when best to apply and how to write their applications quickly and efficiently. They also learn how to develop the kind of portfolio of fundable work-packages that makes it possible both to respond very rapidly to funding calls and to develop a sustainable approach to grant funding. They learn how to write the kind of prose that communicates effectively both with the grants’ committee that will decide on their grant applications and with the expert referees who will advise the committee. They learn how to read their own applications critically and how to provide constructive criticism to colleagues. Our support consists of a tailored mix of lectures, workshops, one-to-one coaching, consultancy and editorial support, depending on institutional and individual requirements. We are experienced at working with short deadlines and can provide individual editorial help with very rapid turnaround. Our approach is based on many years experience working on a range of grants committees, line-managing academics and helping our staff and our colleagues to write successful grant applications. 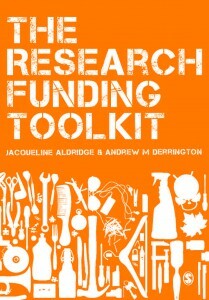 It is described in the highly acclaimed book The Research Funding Toolkit, which is supplemented by our blog.